Tomorrow is Good Friday, the day when, traditionally, western Christians ended their Lenten fast. In Britain, this was marked by eating hot cross buns. So I’ve just made a batch, from my recipe. It’s a day early, but what the heck, the local supermarket has been pumping out its fake hot cross bun smell for at least two months already and most people probably aren’t even aware of the old traditions any more. My recipe involves handling quite a sticky dough, so that got me thinking – perhaps I should have included some more advice about how to handle it. But it’s quite an important subject for making, so here’s a whole post on it. When I talk about sticky doughs, this generally means doughs with a higher proportion of liquid to flour. These are called higher hydration doughs, and they often make for the best breads, especially with wheat. They can be softer, with a more open crumb and a better crust. If you’re doing an enriched dough – for a brioche, challah or any number of feast day bakes such as hot cross buns – the stickiness can also be further exacerbated by extra sugar, fats and egg. A typical error inexperienced bakers make is to keep adding flour to such sticky doughs – putting lots on the work surface and adding more to the mix itself until it stops being sticky and feels easier to handle. This isn’t great, as it will make the crumb dense and dry. And if you add too much extra flour later on, it’ll miss out on the fermentation, being essentially raw – and indigestible. Anyway, Ecco! Or voila, as we say in English: here are my tips for handling sticky doughs. 1. Get yourself a plastic dough scraper. 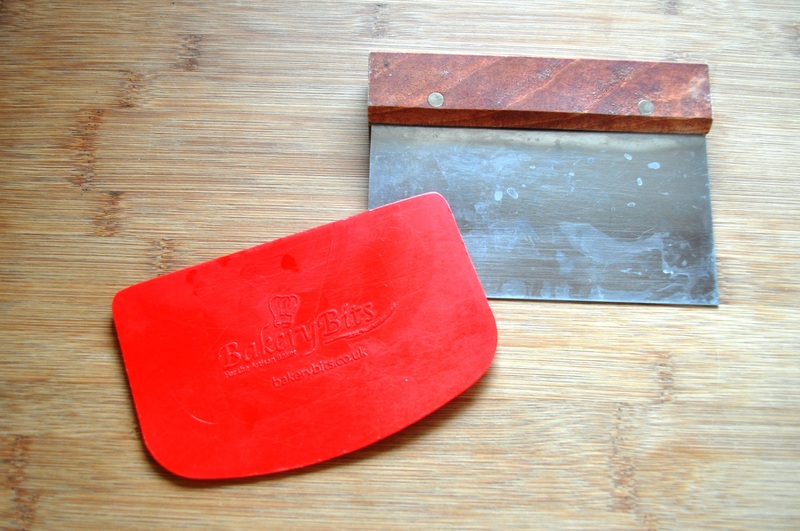 Seriously, after a bowl – and an oven of course – this is the most useful bit of kit for making bread dough. As a sticky dough adheres to your worktop, use the scraper to keep freeing it. You can also use it to make sure any bits of dough that go astray from the main lump are reincorporated. This the type I use. It’s a reasonable size and has a straight edge – good for the worktop – and a curved edge – good for freeing dough from bowls. Not quite as essential as the above, but it can be used a similar way. One option is called a Scotch scraper. You can sprinkle your worktop with flour, but on the initial knead I prefer to oil the worktop. If you have a stainless steel or even marble surface, it’s not so relevant, but if your worktop is wood or bamboo (like mine), smear your work area with a few drops of oil. Generally I’ll just use sunflower seed oil, but if I’m doing an Italian or Middle Eastern bread, I may use a bit of olive oil. The oil stops the dough sticking… quite so much. After your first knead, and before you put the ball of dough back in the bowl, clean it. Dry it then add a dribble of oil and rub it around. Again, this’ll stop the dough sticking to the bowl, so it’ll come out more easily when you do your second knead. It’s not essential, but it’s helpful. Watch a professional baker or an experienced home baker in action, and they don’t mess about with the dough. It’s handled with quick, confident movements. Indeed, even if you have a sticky dough, and are kneading it by hand, as you develop it, it will strengthen, become less sticky and start to form a ball. I would recommend getting hold of Richard Bertinet’s book Dough, as it comes with a DVD that shows this process. Someone has posted that video on YouTube, though I’m not sure how long it’ll stay up. He starts kneading from about 4 minutes in. Some people like to wet their hands, but I like to put a bit of flour on mine, not unlike weight-lifters dusting theirs with talcum powder. It’s not something I do assiduously, but it can be a handy way of making things a bit easier without resorting to adding loads of extra flour to the dough. Also, towards the end of the knead I’ll clean my hands with some flour. OK, I’m not exactly cleaning them, but if you rub some flour between your hands as you would a bar of soap, it helps to get any dough off. My tactic is to do it directly above the sticky dough: the extra flour falls onto and around the dough, and I can then use the plastic scraper to tuck it under the lump, making it easier to form into a ball and put back into the bowl. It takes a bit of practice and discipline to resist that urge! Easter Sunday and still the buns are going strong. Toasted and with lots of butter, they made a very good breakfast.